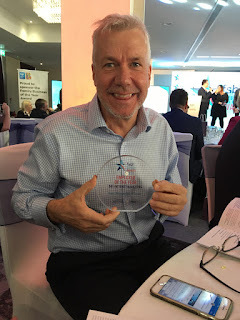 David Clarke, the Director and founder of DBS Internet Marketing, has been celebrating his 23rd work anniversary at the company, and marked the occasion in style by winning the East Midlands “Employer of the Year” award at the FSB Celebrating Business Awards 2019. David was born in Nottingham and originally founded DBS in California in 1986 as a print advertising company (DBS actually stands for Directory Business Services). He returned to the UK with his family in 1994, founded DBS in the UK two years later, and has been a director of the company ever since. Over the last 23 years, David has transitioned DBS from its original focus of print advertising to being in a position where it specialises almost solely in web design and internet marketing. During that time David has also built the business to the point where it became employee owned two years ago, making DBS Lincolnshire’s first 100% employee owned company. To find out more about David and to connect with him on social media, please visit: http://www.dbsinternetmarketing.co.uk/our-team/1/david-clarke/.